Clarke & Severn Electronics presents a new white paper by Switchcraft and Conxall on key factors to consider when selecting cable assemblies for critical connections. When selecting cable assemblies, one has to choose between field-assembled cables and overmolded cables. Making a choice between field-assembled cables and overmolded cables depends on several factors including cost, quality, market, product/application, and end-user. This Switchcraft white paper draws on more than 60 years of design, manufacturing and in-the-field experience and expertise to help answer this question: Field-assembled or overmolded? Field-assembled cables involve manual assembly of the connectors to the cables. Granted the quality of the connectors is good; however, field-assembled cable connections are only as good as the people in the field doing the assembly, and there is a big possibility of the assembly personnel making mistakes. Comparing the cost of field-assembled cables to overmolded cables is, for the most part, like comparing apples to oranges. The product costs for field-installable cable assemblies are obviously less expensive. But once the cost of labour and the costs associated with higher error rates for field-installable cables are added on, overmolded cables might just offer a lower total cost of ownership. 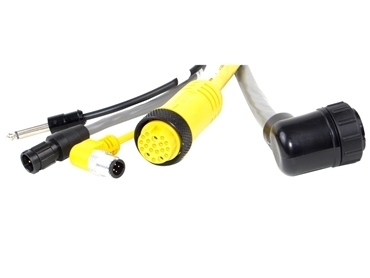 An overmolded cable seamlessly combines the cable and connector into a single part. In overmolding, molten material is injected into a mould cavity and the cooled material conforms to the shape of the mould. Overmolded cable assemblies offer ease of installation. Key factors that commonly drive the specification of overmolded cable assemblies include environmental concerns, strength and security of the connection, aesthetics and flex relief. When environmental concerns are considered, there is little to no chance of the sealing on the overmolded cable assembly becoming compromised. The rear of the connector area is permanently sealed and the connector part of the overmolded cable will perform as rated in harsh weather. Overmolded cable assemblies have integrated strain relief, giving them the ability to absorb up to 70 pounds of pullout force. Getting this strength of connection in a field-installable cable is typically more difficult. In terms of aesthetics, overmolded cable assemblies reflect quality, which is important for medical equipment, high-end, high-tech hardware, or any expensive, sleek, high-performance machinery. Lastly, overmolded cable assemblies offer the option of a secure flex relief, which will help limit the cable bend radius at the exit of the connector. Overmolded cable assemblies can also be used for EMI shielding applications and can be custom designed for right-angle exits or any exit configuration required for the application. Overmolded cable assemblies can be colour coded to fool-proof equipment installation or usage. To summarise, in a controlled environment, for volume installations of equipment and for devices with a limited number of mating cycles and with competent field-assembly personnel, field-assembled cables will usually serve the purpose. In all other instances, consider using overmolded cable assemblies. Is the manufacturer overmolding its own product? The supplier that manufactures and overmolds its own connectors controls every aspect of its production. It stands to reason then, that the manufacturing and overmolding process will involve a higher degree of precision and uniformity and result in a higher quality component. Is the manufacturer local to your continent? Since shipping cable is expensive, one is almost always better off sourcing product local to their continent. Switchcraft and Conxall are responsible for their overmolded cable assemblies from design and production of the connector and overmold to precision-assembly of the finished unit, accompanied by stringent quality control checks every step of the way. Every moulded cable assembly produced is also backed by a lifetime limited warranty.